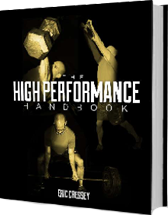 The High Performance Handbook is the most versatile training strength and conditioning program on the market today, as many individuals have used it with success for goals such as fat loss, athletic performance enhancement, and increased muscle mass and strength. The program begins with an easy-to-apply self-assessment component that helps you to determine which program is the right fit for you. Easy exercise in the program is featured in a detailed video coaching tutorial, with over three hours of footage in all. It's like having your own coach right there with you. If you're looking for an up-to-date, High Performance edge, this is the resource for you. Sturdy Shoulder Solutions is a modern guide to the Who, What, When, Why, and How of Shoulder Care for Health and Performance.